Okay, I am backtracking a little bit here because I created my website after I had gone on a few note-worthy trips. Bear with with me! This 5 day vacation in the middle of December (2016) was hands-down one of the most memorable trips I have experienced so far in life! I really lucked out with this one because my flight and lodging was free through work! I traveled with my supervisor and dear friend, Meagan, and we were both off-duty which allowed us to spend the whole trip relaxing and exploring the southernmost part of Florida. We traveled with our unit, and our good friend Kate who was on-duty was kind enough to let us bunk with her. 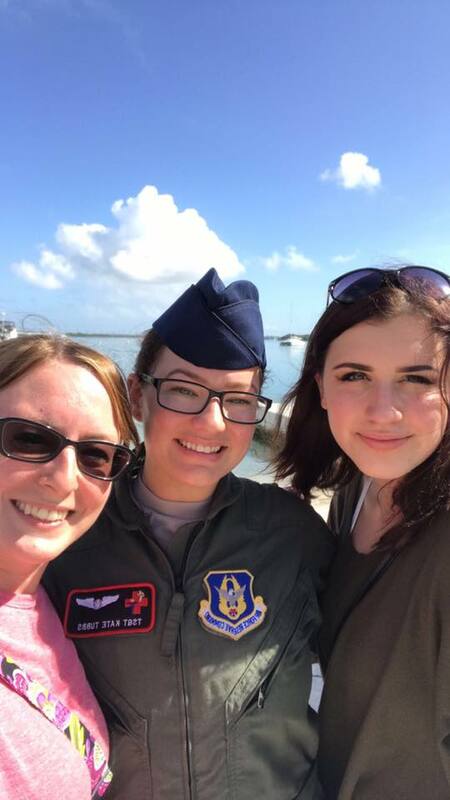 Pictured here is Meagan (left), Kate (middle), and me enjoying the Florida heat in mid-December! I don't even know where to start with Key West. From the lively streets that are buzzing and excitement-filled all day and through the night, to the people who are just as exuberant, and the food that was incomparable- Key West was a magical place that felt like a land apart. I guess I'll start with the chickens. Yes, there were chickens running around the streets, much like you would find in Hawaii, and it definitely contributed to the uniqueness of Key West. Evening more alarming than the chickens running amuck were some of the people you will find in Key West. I'm talking elderly men walking around in banana hammocks and people walking around in costumes on a typical day, it was definitely an experience (I thought it was kind of awesome). The southernmost Point of the Continental US! Now let's talk places. There are so many treasures in Key West, some in which I was able to experience and others that demand a return trip so I can experience all that this amazing place has to offer. If you go to Key West, you absolutely have to go to the Southernmost Point of the Continental U.S. (pictured above). There is a sweet little landmark that you need to snap a photo with. From this point, you are only 90 miles from Cuba, how cool is that? Not a far walk from this point is a nice little beach you can relax at called South Beach- it's about a 10 minute walk from the Southernmost Point (pictured below). Getting to the more important places- food! This is really where I spent the bulk of my relatively cheap vacation. The first restaurant I experienced in Key West was the Stoned Crab, and it did not disappoint. When in southern Florida, you have to eat seafood! Especially being that I have lived in Western New York my entire life with very limited opportunities travel until recent times, this was a special treat for me. The seafood at The Stoned Crab could not have tasted more fresh. I ordered calamari and a crab and lobster pasta- it was one of the most tasteful seafood meals I have ever tasted. Although I should note, the prices at this restaurant were a little higher than what I would usually pay. I think I dropped near a hundred dollars between my meal, appetizer, and two drinks. This was definitely my 'treat yo self' meal of the trip. Another place to grab some food that is definitely worth mentioning is the Banana Cafe. I grabbed brunch here with my girls one of the late mornings of our trips and it was heavenly! This french cafe served up some incredibly flavorful crepes (my weakness) and the atmosphere of this little cafe was so lovely. Our waiter was so friendly and very personable with us. Outside of an antique and souvenir shop near the Southernmost Point. Okay, down to business- bars! Key West is absolutely notable for its drinking scene. Duval Street was the most prominent part of Key West, full of bars (in addition to shops and restaurants) and was never lacking people or noise. If you are looking to grab a couple of drinks or completely let loose, Duval Street is the place for you. I visited a few bars during my trip, and each had its own atmosphere and was so much fun. If you're looking for a smaller bar with more grunge, live music, and good food, then Hogs Breath Saloon is the place for you! On a larger scale with a similar atmosphere is Sloppy Joe's Bar, which is more central on Duval Street. However, if you're looking for extra personality and one hell of a time, Irish Kevin's Bar is the place for you. This was my favorite bar by far, and it was buzzing with people. The music and drinks were fantastic, but the most memorable part of the bar was the host- Kevin. Kevin is an older irishman who would call people up on stage every couple of songs and recruit them for drinking challenges. I promise, if you go to Irish Kevin's, you will leave with some fun and unforgettable memories. Matching tattoos with Kate and Meagan! There's something about Key West that encourages crazy behavior. All of my stress and responsibilities seemed to leave me the moment I arrived until the moment I left, and vacation Jess was on full blast. One of the more crazy decisions I made was a spontaneous tattoo of a palm tree (pictured above) that I got with Kate and Meagan. As basic and erratic of a tattoo as this was, it happens to be one of my favorite tattoos, just because of the memories that come with it. When in Key West! I could absolutely go on about the places I've visited, the food I ate, and the experiences that I had while in Key West, but for the sake of this post's length, I'll spare the excess details. I'll leave you with this my friends: if you are looking for a short escape from your life and a place where you can let loose and cease the day, Key West is just the place you need! First day exploring Key West with Meagan! Meagan on the streets of Key West!